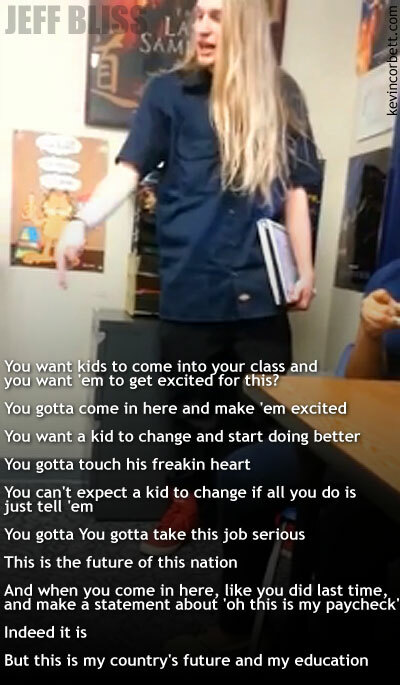 Eighteen year-old Duncanville High School (Duncanville, TX) sophomore Jeff Bliss gets mad and gives his teacher a message. It all started he says, when she told him to “stop bitching”. Following the transcript is an investigative news report and a detailed interview with the student that is quite revealing. you want kids to come into your class and you want ’em to get excited for this? What do YOU think of Jeff Bliss, his message to his teacher and his explanation in the follow-up video? I’d enjoy YOUR comments below!